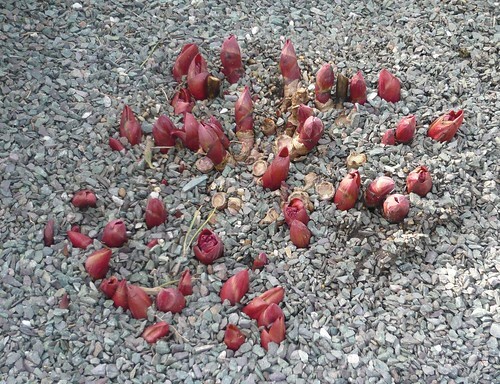 A four foot square clump of plump new peony shoots were highlighted at Kew Gardens by the grey, gravel mulch around them. I have not suffered from slugs on Peonies, nor have they had problems with rotting, so I do not put gravel around my plants. However if it is OK for Kew then I guess it is OK for me. At least it would be a decorative improvement on my bare soil. Ask two gardeners about mulch and you will get three answers. For example when asking about mulching Peonies I got these answers ‘Three popular choices are straw, compost or dry leaves.’ ‘Some popular spring mulches are shredded bark, pine nuggets or straw.’ So no gravel there then! Planting too deeply may prevent the peony from flowering, they do better for a bit of frosting on the crown apparently. Peonies can live for over 50 years and mine flower just fine so I am leaving things as they stand ie. very occasional autumn mulch when the compost heap has generated compost to spare . 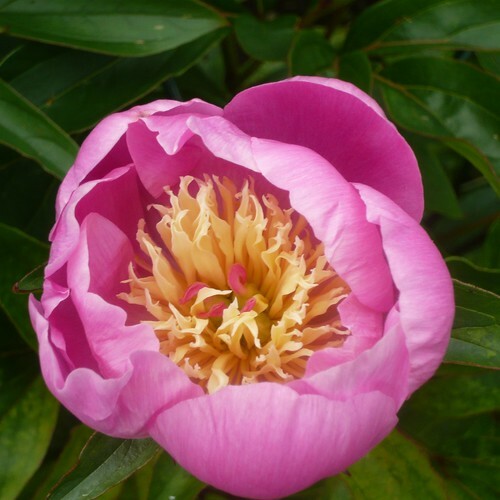 Remove any weeds that are growing near the peony shoots or stems. Weeds take water and nutrient and look bad. Fertilise in spring with a dry compound like growmore. Fertilise again in autumn with a potash based feeder. Remove ant rotting vegetation that may harbour fungus or disease. I have peonys coming up in my gravel driveway, maybe an inch or two high. Any suggestions on how to move them?